Novelist, essayist, art critic, painter, campaigner and broadcaster, of international significance and renown. It was whilst living in the Forest of Dean that he got to know a St Briavels' GP. With documentary photographer Jean Mohr he created the book A Fortunate Man (1967) that became recognised as a seminal work on the GP-patient relationship, and the role of the doctor in a rural community. In 1955 Berger married his second wife, Rosemary Sibell Guest, (herself an author writing under the pen name Evelyn Jordan), daughter of 1st Viscount Wimborne, and recently divorced from Alistair Boyd 6th Baron Kilmarnock. It may have been Rosemary's eldest son, who had met John at an exhibition of his paintings, who first introduced them some years earlier. After her divorce Rosemary and John moved to The Dower House in Newland with her teenage son known as 'Tiger'. He suggests that Rosemary may have wanted to distance herself from the London and home counties social set. She was also friends with Wogan and Tamara Phillips who lived in Gloucestershire (Wogan Lord Phillips was a communist peer in the House of Lords). Fellow Marxist, writer and critic Phillip Toynbee had already moved to near-by Brockweir. It was during this period living in the Forest of Dean that Berger got to know his local doctor, Dr John Eskell, who would later inspire him to write A Fortunate Man. What started as a doctor-patient relationship developed into a friendship, firstly over playing bridge with fellow writer and friend of Eskell, Victor Anant who was also living in Gloucestershire. ​With the demands of his developing career in writing and broadcasting Berger was often in London but is remembered by his Newland neighbours of the time. He gave his address as The Dower House in the electoral register of 1959, but was already by that time in a relationship with writer and critic Anya (Anna) Bostock. After some time travelling together John and Anya moved to Geneva in 1962, however the birth of their son Jacob was recorded in 1963 in Lydney. It seems likely they were visiting Eskell at the time as Berger, sometimes alone, sometimes with Anya, often did. Dr Eskell and his wife maintained a wide social circle that included many common acquaintances. People in St Briavels today recall Berger visiting Eskell many times during the 1960s, and he remained in touch with him until Eskell's death in 1982. In 1967 the book A Fortunate Man was published and it was soon regarded as a masterpiece. 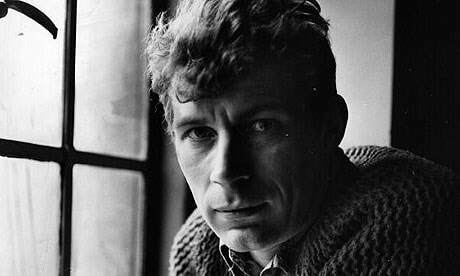 Its popularity only increased as John Berger become ever more widely known as a writer and broadcaster. The book explored the relationship between a rural doctor and his patients and became recommended reading for trainee GPs. It is arguably one of the most important and influential books ever written about medical general practice and the role of the GP. It was published at a time when post-war social medicine was struggling to come terms with inequalities in health and demands on medicine that were beyond purely the relief of symptoms. John Peter Berger was born on 5th November 1926 at Stoke Newington, north London. His mother, Miriam was from a working-class background in Bermondsy, was a vegetarian and Suffragette. His father Stanley, a Hungrarian emigre, served as an infantry major in WWI (winning the Military Cross), and after a series of failed business ventures worked for the Institute of Cost and Works Accountants, later being awarded the OBE for his work there. John attended Sunnydown School, then St Edwards public school in Oxford, an experience he hated. Leaving at 16 he joined the Central School of Art in London, but in 1944 was called up to the army. This would be a formative time for him in regard to his political views as for the first time he was living and working amongst men form a working-class background. After leaving the army he returned to art college (this time Chelsea School of Art) with the sculptor Henry Moore amongst his teachers. He took up painting, which he exibited, and later taught drawing at a London teacher-training college. Whilst teaching drawing at St Mary's teacher training college in Twickenham, and continuing to exhibit his paintings, a friend asked him to do a series of talks on art for the BBC World Service. This brought him to the attention of The New Statesman magazine and he became their regular art critic in 1952. In 1958 he published his first novel, A Painter of Our Time , two more would follow - The Foot of Clive (1962), and Corker's Freedom (1964) - before his award-winning novel G in 1972. In his Booker Prize acceptance speech for G he criticised the award's sponsors as a company that had profited for 130yrs from the exploitation of the Caribbean, and announced he would donate half of the prize money to the Black Panthers. He would go on to write several more novels including his trilogy inspired by the lives of the people in what became his adopted rural home of Quincy in France. He also wrote and published poetry, plays, and screenplays. His output of books on art, art history and art theory was immense, as well as also journalism and essays. He frequently collaborated, and he worked on many projects with friend and photographer Jean Mohr. By his death in 2017 Berger was considered to have been one of the most significant and highly influential figures of his time, making contributions to in both the academic and wider appreciation and understanding of art, culture, and society. The setting of the book, the doctor, and his patients were all anonymised - possibly so that it would be taken as applicable more generally rather than specific to this one place. The patient community are simply described as 'Foresters' - although The News of the World newspaper soon disclosed the real location as St Briavels. 'Dr John Sassal' in the book was in fact Berger's friend Dr John Eskell. It is a carefully worked out set of relationships – alternations of text and image; picture sequences and page turns – performed and realised by design. A critically acclaimed photographer in his own right, he was Born in Geneva, Switzerland, in 1925. Mohr studied economics & social sciences and worked briefly in advertising, before working with the International Red Cross in the Middle East. After a period studying painting in Paris he took up photography. Much of his work focused on capturing the lives of refugees and migrants around the world. Whilst the book is in large-part a portrait of 'Dr Sasall' it follows his work through a series of local patient cases so inevitably it also explores them and their lives too. At times the book reads like a novel as Berger seeks to describe scenes, people and internal thoughts, whilst at other times his searing socio-political analysis and critique comes to the fore. In reading the book it's worth remembering the job that Berger & Mohr expected the pictures to do: what aspects of 'Sassal', his patients and their lives missing from the text are in fact to be found portrayed instead in the photographs? Although widely accepted as a definitive study of general practice and the role of the GP the book has not been without its critics, not least because it leaves out Dr Eskell's wife who was a crucial support to him in his work, particularly during his severe bouts of depression. The book has also been criticised for its over simplified portrayal of life in and around the Forest of Dean at the time. ​It views ordinary people in the area as poor, isolated and poorly educated. The social mix of the area was actually more diverse. As well as farming, many people in the area were employed in modern light industry, and there were also professional and middle class people living in the village. "Dr Eskell exemplified the understanding that it is not just the symptoms that are important but how a person portrays them – and really to be able to understand that the GP needs to have a long-term relationship with the patient. It is about continuity of care"
Eskell also suffered from bi-polar disorder or manic depression, a problem acknowledged in the book. This prompted mood swings; periods of great creativity and days of dark depression. In later years this presented great challenges. His wife died in 1981 and he retired the same year. ​On 16th August 1981 he committed suicide, aged 63. As part of A Fortunate Man remembered...50 years on events in June 2018, local residents in and around St Briavels recorded their memories of Dr John Eskell. These audio slide-shows give that community's own take on 'Dr John'. ​Rick Poynor, Eye Magazine, 10th March 2015.